Safety issue is less an issue. How do you see it differently than consensus? “Money is social credit”. It also applies to corporations. A biotech company’s income depends on the social value of its work (drug/device), not the shareholders’ value. Only first three are FDA’s responsibility as quoted below. The fourth “convenience” factor’s social value is inevitable. Just compare an injectable drug and oral drugs. With these four value factors in mind, we investors want to find and help biotech companies that generate social value by investing in them. As the company creates social value, we get social credit – money – along the way. It is a “win-win-win” situation, for the company, the investor and a better world. What we learned so far includes two sides of the struggle for approval: FDA and Companies. Note: FDA faces tremendous pressure from sponsors, patients and public to bring safe and effective new drugs to the market faster. It is expected that FDA may loosen its strict control on certain indications with huge unmet medical needs and approve more drugs. These indications include orphan diseases, female libido and other areas that no drug is currently available. As strict as FDA is, the regulatory statistics discussed below may change as FDA evolves. Its implication for investment decision will also be affected. Nonetheless, studying what happened before can provide insights for the future. 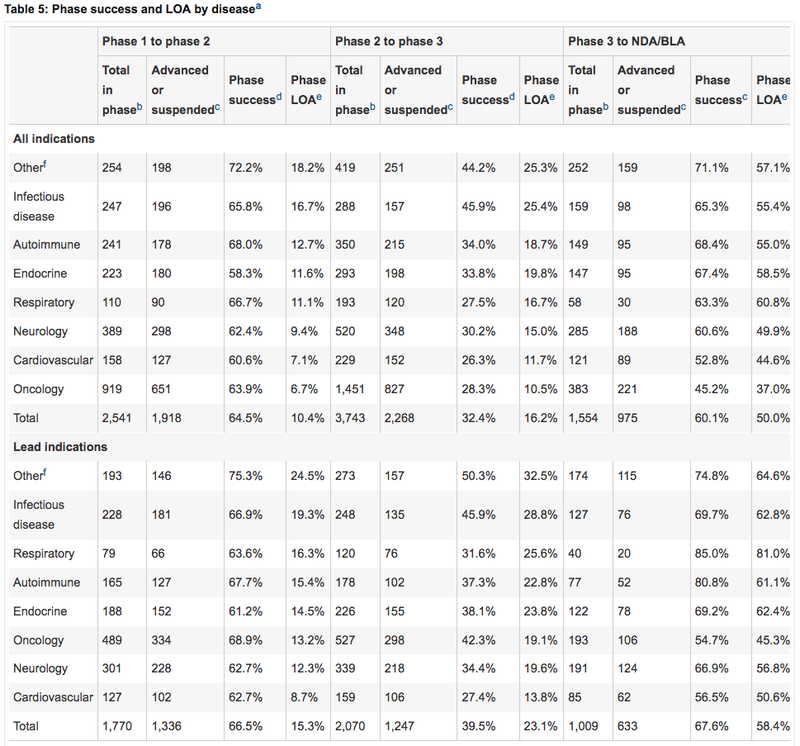 Clinical development success rates for investigational drugs. Hay et al. 2014 Nature Biotech. It generally took 20 years from scientific discovery to clinical and commercial adoption. – David Brindley. Nature June 16th, 2016 A decade of iPS cells. Since FDA is always involved in drug trials and NDA filings, why there are so many cases of CRLs, especially demanding more data or trials? Why does FDA allow the NDA filing in the first place? This paper gives comprehensive statistics on approval rates. It considers indication, round of review, company size, leading, NME. orphan designation etc. As shown in figure below, first submission on average only has 57% chance of approval, while 88% eventually gets approved. Discussed below in “CRL is not the end”. Inexperienced companies usually do not handle their first NDAs very well. Will be reviewed by two main branches of FDA: CDER (Center for Drug Evaluation and Research) CDRH (Center for Devices and Radiological Health). The chance of something goes wrong is higher when you involve more parites. For example, human factors in device operation. For example, vaccines are 100% approved once they reach NDA stage. Vaccines are 100% approved once they reach NDA stage. 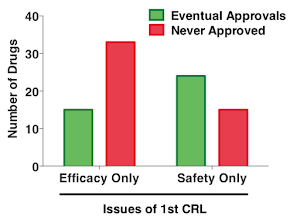 If there is SAEs (severe adverse events) in the clinical trial, even if it may not directed connected to candidate drug, the chance of CRL and additional trial is high. But as “Safety issue is less an issue” pointed out, it can be solved eventually and present high investment potential. Unlike giant pharmaceuticals, small companies are usually inexperienced and lack of resource or connection or relationship when dealing with FDA. Rejection is not the end of the world. Approval does not always come first cycle. As shown in figure below, first submission on average only has 57% chance of approval, while 88% eventually gets approved. This is true especially in Neurology indications. It suggests that first submission are usually not perfect and FDA can always find some flaws. But eventually it will be solved. This “CRL then approval” type of cases have huge investment potential. Not all rejection is the same. never approved vs. delayed approved: 1) safety issues similar 2) efficacy deficiency much more frequent (76.3% vs 39.4%). Sack et al. studied 151 cases of first-cycle review failures during 2000-2012. 71 of them are eventually approved, while 80 are never approved. The authors correlated their first-cycle deficiencies to their eventual outcome. They found those four types of reasons are not equal. Some are easier to solve than the others. The most counter-intuitive finding is that safety issue is actually easier to solve than efficacy issue (see figure below). My interpretation is that safety issues can be mitigated by proper labeling, dose adjustment, population restriction, etc. But when a drug is not effective, it is hard to improve and the benefit to patients is questionable. For detailed data statistics, please refer to the paper. All That Glitters Is Not Gold. How to Screen for Successful Ones? Market conditions affects expectation. I try to separate this factor. Phoenix reborn: CHTP, DVAX, ACAD. near death with CRL or Trial issue, then come back strong. Great investment. Priced-in ones: MNKD. Approve then no change, or go down slightly. Usually approval is expected. Pipeline weakness? Trash or Hype: DCTH, AEZS. CRL then down to penny. Unnecessary: As a group, insights mostly come from discussion. That’s the strength of our club. Researchers burn out, never want to do it again, or leave the club. In this framework, we exclude mature big companies. You would rather buy IBB index. PDUFA is a nice pre-screening that we can select candidates companies that survived Phase I.II.III. It is also a deadline around which we can plan our meetings. Each partner can exercise his/her own expertise, preference, and creativity. 情怀: built on one key patent, compound, chemical, device, procedure, or platform. A company that has vision, mission and focus. (Buyouts and ignored gems). – Hao X.
Unbiased screening: Even a bad company is Ok. It’s also learning experience. Of coz, we have to screen out obviously bad candidates. – Bo Z. Behind the success of many companies is a focused mission: Gilead focuses on antiviral drugs with its nucleotide analogs. Celgene focused on HIV and hematology. Cubist was antibiotics. One drug candidate may fail. But the unique experience is always going to be valuable. It will only get deeper with your persistence. “All have been invented”. Many text book knowledge had become driven force into fruit. Should refer to above “Likelihood of approval” to assess. Note: Only financial analysis is covered here. For investment decision, please refer to PSIC Investment Chapter. Big institutional investors, who need to buy big chunk, can only buy at often inflated offering price. As small investors, we should buy cheaper than that, at least half the price. How strong is the trial results? How confident is the management? Are they realistic? Or dodging any warning sign? What questions are analysts asking? What do they care? How does management respond? Do we (PSIC) see anything different? For one ultimate scientific question about this drug, how do PSIC see it differently than consensus?